We were able to set up Free Prayer in our favorite Florissant spot this week! It was good to be back where the banner (and porta potty) had gained such recognition last year and many people had stopped. We noticed that the locals are beginning to recognize us now in the trailer — and many were honking and waving. A county commissioner pulled in, rolling down his window and laughing, and said, “Wow, I’ve never seen anything like this! Could I take a picture of your trailer?” “Sure!” He snapped a couple of pix and chatted a few minutes and then said he had to run to a meeting. Yesterday when we were set up on the roadside at Denny’s, I had noticed six cars that pulled halfway into the parking lot. Every time a car pulled halfway onto the parking lot apron, it would stop and either back out and drive on or stop and make a U-turn and pull out and go the other direction. This happened throughout the time we were there. Then I heard the Lord say, “Ok, time to go home!” We had only been out for an hour and 45 minutes and I said, “But Lord, should we at least stay until 1:00 like you told Karen?” He said, “Sure.” So I asked Him, “Why are we packing up so soon?” He said, “The people that I told to stop chose not to and went on down the road instead.” We began locking up the cabinets and all of a sudden, I felt a huge amount of grief welling up in my stomach and coming all the way up. I felt myself begin to tear up and I realized I was feeling God’s grief. I asked, “Lord, what if these people come back? WE won’t be here.” He said, “Doesn’t my Word say to seek the Lord while He may be found? [Isaiah 55:6] They chose not to stop and not to be set free, which is why I had you here at this place at this time.” As I stood in the trailer, overwhelmed with grief, I began to sob and said, “Lord, did you say person or people?” He said, “People. I had many people whom I called to stop today to get delivered and set free. But not one of them stopped. They all chose to go down the road instead. Now go home.” All the way home I could feel God grieving over these people and I realized He knew they were not coming back. God had us there at that place and at that time just for them, but they were not willing. In 15 years on the roadside and in many states across the US, this is the first time we have ever had this experience of the grief that God has when people CHOOSE (and that was the word He kept using–they CHOSE) not to obey His promptings. How great is the love of God that He would have us at the right place at the right time to intersect six cars of people to show them how much He loves them and how much He wants to set them free. We discovered a great new site and went out Tuesday for 3 hours. No one stopped but we were encouraged by the good reception. We will post pictures and the full story next week. We lost our beloved nearly 12-year old cat, Moose, to cancer unexpectedly Wednesday and we are working through the grieving process with the Lord. We will be back on the roadside next week. Yesterday Karen and I drove around checking out our three sites that we usually set up our Free Prayer. All three sites are covered in soggy mud do to our last snowstorm and one pullout still has about 8 inches of snow on it and is inaccessible do to a foot and a half snow wall from the snow plows. So today we are driving around to see if we can get permission from local vacant businesses that are for sale and see if we can obtain permission to use their paved parking lots! We are so ready to resume Roadside Free Prayer! We will keep you updated as The Lord reveals our new locations! Emil braving the elements! Next year, a snowblower!!!!! What a Day on the Road! Prayed with a lady who is fearful because they’re buying and moving into their first home, prayed with someone whose scared of a bad diagnosis from the doctor, prayed for someone else having complications of stress affecting her health, prayed with someone who was grieving because they had lost someone dear to their family, prayed with someone who is just trying to deal with changes in life–even though they’re for the better, change isn’t easy. Prayed with someone having complications from surgery, prayed for a woman whose stress is over the top about finances, prayed for someone going through a divorce with an abusive husband. Got to pray with a person who is about to take a trip to visit family which usually entails dealing with self-centered and difficult family members, got to pray with someone dealing with the effects of domestic violence in their family. We ourselves could use prayer as both us have been under the weather for about a week. We are excited to watch the Lord meet all these needs. No matter what anyone is going through, Jesus is the source of all we need! 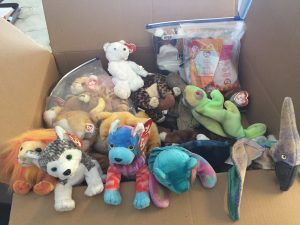 Today a box full of Beanie Babies arrived! Thank you Kendra!! We use the Beanie Babies on the roadside. Every person that receives the Lord gets a Beanie Baby to take home. We write the date on the heart shaped tag attached to each Beanie Baby. This is so the person will never forget the day they accepted Jesus into their heart! Over the past 15 years we have handed out around a thousand! Some people have cried as they pick one out! Some people have stopped a year later and said I still have my Beanie Baby!!! Well, another week goes by with more snow, then melting snow making roadside inches deep in water and slush, now more wind and snow coming in! But God always has people who need ministry and the roadside isn’t always on the “road!” It’s wherever God highlights a person and asks us to speak to him or her. We encourage you as well to keep your eyes open for those people who need you! I heard from a friend the other day whom God used in the hospital while she was awaiting the outcome of a procedure being done on her son. Another woman in the waiting room badly need our friend to minister to her which she did and both women were blessed. God is so good! If you would like to receive our e-newsletter, please sign up on our “Contact Us” page! We ran into insurance issues on the trailer and just received approval from a different company effective Monday. We also ordered a second heater which arrives this afternoon. 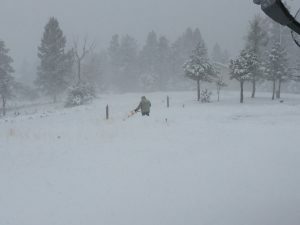 It has continued to be cold and windy this week with some snowfall. A storm is expected over the weekend. But we anticipate being out on the roadside next week!